Click Install option to install the GHMC Elections Mobile App in your smart phones. About 10,000 plus people have so far installed this App in their smart phones. This App was updated on the 17th January 2016. 153 people have given 5 star ratings, 62 people have given 4 star ratings to this app so far. About 74,23,980 voters have been enrolled. Among them, Male voters are 39,69,007, female voters are 34,53,910 and 1,063 other voters (Transgender). 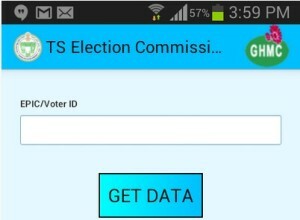 All these voters can download their Voter slip from the official website or GHMC Elections Mobile app. Voters have to enter their Voter ID to get all the required data such as Polling Booth Number, Ward Name Etc..
Not good. It should have contained land marks and also a route map to the p.s During last elections, i have wandered in almost all the area to search the p.s Another point is in the app the mobile numbers of booth level officer should have been given so as to get the details of booth from instead of wasting much time. Moreover the look of the app is also not impressive.